India Travels and Writing: Why My Real-Time Blogging Plan Didn’t Happen | Wake Up, Mama! That is, until recently when my family and I took our fifth trip to India—our first since I started writing. What more perfect a smorgasbord of material could a blog writer ask for than three weeks with family in another country and culture halfway around the world? I thought I would blog in real time. As it turned out, that didn’t feel doable. It wasn’t due to lack of time. Jet lag provided me with ample time in a quiet house (very) early in the morning. It wasn’t lack of ideas, either. Plenty of those came. Traffic safety… sensory experiences…children and childhood in India…being a good daughter-in-law as an American in an Indian family…the rhythm of the days…the experience of being The Other, the foreigner, and how it’s different from my husband’s experience of being foreigner here in the U.S… seeing extreme poverty…travel to a developing country as a privileged and sheltered family member as opposed to a tourist…the differences in middle-class lifestyle here and there…family decision-making in a collectivist culture. To name a few. So yeah, there is no shortage of potential topics. There is fear. Fear of screwing up and saying the wrong thing and being insensitive without realizing it. I’m talking about other people’s country from an outside perspective. Much has been written about the tendency to either judge or romanticize when writing about other cultures. I’m a foreigner there, but not a typical emotionally detached tourist. 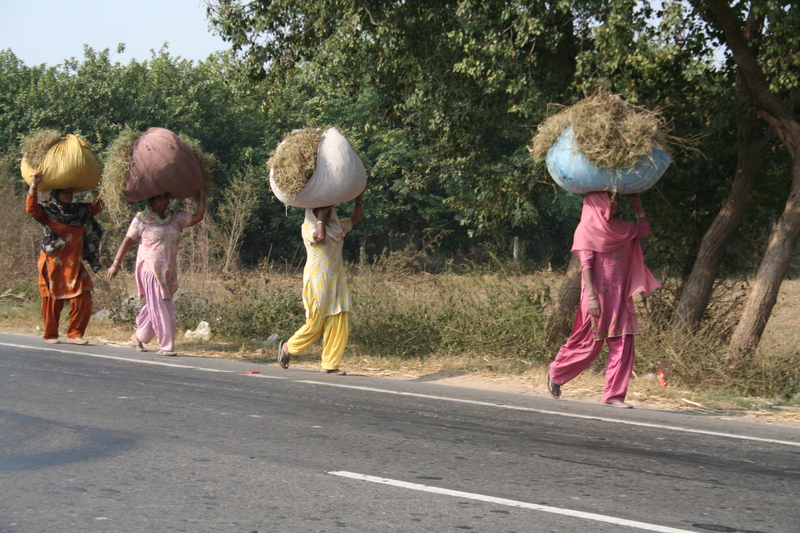 (You can read about how I came to be a regular traveler to India here.) I don’t want to treat our time there with my family as some sort of anthropological study. People really are pretty much the same wherever you go. And yet, it is fascinating to observe and think about all the things that are different. Not better, not worse–usually really and truly just different. But let’s be honest, as much as I try to remain open-minded–toward both cultures–I do have the occasional opinion about better or worse. And when I started writing potential blog posts in my head while I was there, they often took on this subtle flavor: We do this here, they do that there. This is better here, that is better there. Ick. And the biggest challenge is that it’s simply so MUCH. When you’re in a busy street market in India, you can’t capture the sensory overload in verbal or written descriptions, photos, or even video (I’ve tried!). You really do have to be there. You stand there, taking it all in, and so much is hitting all your senses that it’s hard to focus on any one thing, or to decide which thing is most worthy of your attention. The writer part of the brain kind of feels the same way, with all the potential material swirling around. I shared a ton of photos on Facebook. This was the first trip during which I’ve done that, and it was fun to have people from back home along for the ride. And in retrospect, I think I also did it because it let me off the hook for not following through with my real time blogging plans. One story bubbled up to the surface right after I returned. As for the rest of my posts about India, it looks like they will need to gestate for a while. They must be slow cooking in the mud stove, over a fire fueled by cow dung cakes. I remember having a full blown panic attack while in the streets of India. The overload to my senses was far more than I could handle. And when I returned home I remember thinking how Boston felt so … empty – comparatively speaking, anyway. And when I tried to explain it to people, the crowds, the sights, I was often met with, “Like New York City?” I couldn’t do it justice, not by a long shot. As for the rest, I’m sure you will find some balance when writing about it, but it is difficult not to gape at some of the sights, not so much in judgment, but in awe. I enjoy your blog so much (and will definitely have to sit and chat with you before my next trip to India) and look forward to reading more. Oh, and btw – I like that your blog covers all sorts of topics. It’s more like life. I find sometimes with mine, I have things I want to say and write about, but I’m definitely stuck with the travel theme. Perhaps someday I’ll create an additional blog. I totally get how a person who is sensitive to a lot of sensory info could have a panic attack. Thanks for saying that about my multiple blog topics. I am relieved to hear that, because I have been thinking that my blog suffers from lack of identity! But that’s the thing–there is as much worth writing about as there is worth talking about! And you should start another blog! For some reason your second comment doesn’t allow me to reply – but I’m more than a year behind in the travel blog, I doubt I’d have time for a second. But I want to finish blogging the road trip, no matter how long it takes, as I hope that someday the little guy will enjoy knowing where he came from. Camille, I understand your quandary. I hope you find a way, that makes you comfortable, to share India with us because it’s a life/place I’d like to see through your perspective. At the risk of saying something inappropriate, I do have a question that I’ve wondered about for a very long time but I was afraid to ask. After watching that cow cake video I have decided just to go ahead and ask. I see picture after picture of women in beautiful clothing. Colorful. Gorgeous fabrics. Beautifully made. I also see men in light colored clothing head to toe. And I hear about the poverty and the things they do in their daily lives (like making cow cakes!). So that all leads me to this question… HOW do they (both men and women) stay so clean??? How can they have such great clothes and not have them in tatters, full of filth? If I had on those clothes, they’d be ruined in a day. Great question, Melissa! Yes, you see women doing housework and all sorts of stuff in flowing saris effortlessly, and not ruining them. I’m not sure I have an answer for you other than maybe that’s one reason you see more bright colors than pastels, at least on women. I will ask around and try to get a better answer for you!